Ellos – one of the leading retailers in the Nordics decided to work exclusively with Awin. Here’s how we migrated their whole affiliate business to one network. 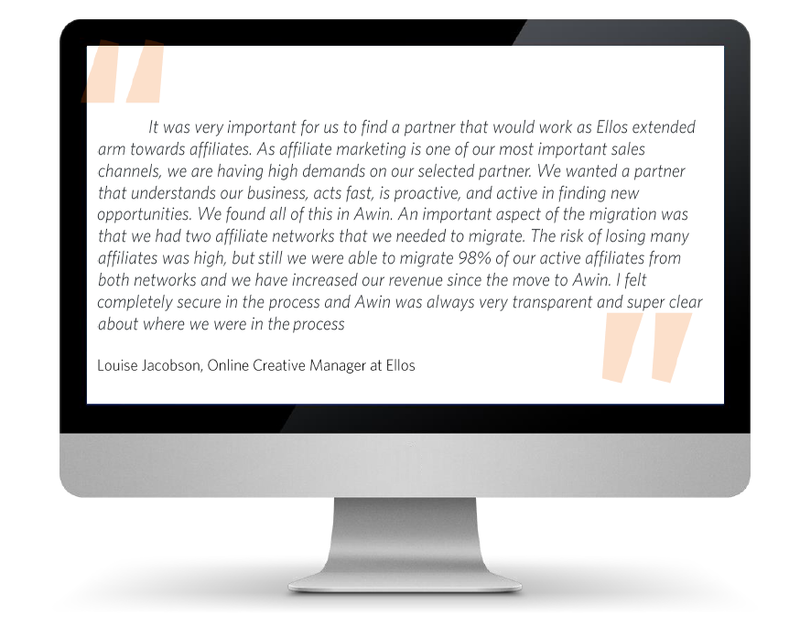 The objective during the migration was to seamlessly implement, manage and migrate the complete Ellos affiliate program onto Awin; keeping all involved partners happy without losing any revenue. This objective was broken down to three main goals. All top publishers were migrated, resulting in 98% of revenue migrated when programs closed on the other networks. During the following months after the migration, an additional 2% of revenue was brought in by adding new publishers to the program. With 100% of the revenue migrated across only 20% of the original amount of publishers, Ellos now have a more manageable and transparent affiliate program without losing any revenue or quality in marketing output. This allows both Ellos and Awin to focus on optimization, growth and campaigns.